The dust has settled and the logs have been checked and tabulated. Now we can see who came out on top by county, state, country, or whatever category you’re interested in. One of the great things about CQP is the many different ways you can stretch yourself and your station to achieve that next goal. Altogether, we received 464 logs this year, which is an increase of 12% over last year. Although not a record in itself, there were many new records set this year. The biggest score by any station anywhere was (again) the massive N6O effort put out by the Radio Oakley M/M folks. Operating five transmitters, they blew past last year’s record of 705k, 5,452 QSOs with a feat of 731k and 5,611 QSOs! With several years in a row of breaking the M/M record, we wonder how long this string of victories can continue. Congratulations to N6RO, K3EST, N6IG, N6BV, K6AW, K6CTA, and WA6O for a great team effort! The CA single op efforts were truly amazing as K6NA (K6LL op) in San Diego worked his way to another CA win. He was challenged by W6KP (N6MJ op), and K6LA, who set new records in Orange and Los Angeles. The San Diego record set by N6TR back in 1989 still stands. This is the same top three as last year. Dan and Ken are closing the gap, so watch out next year. Not to be outdone in amazing feats, the non-CA single op category saw the return of K5GA operating from K5NZ in Texas. His only soapbox comment in his log said simply “I’m back…” Challengers W8MJ and W4CAT finished significantly back. This was a great win; good enough for a new Texas record, but not quite enough to take the “best ever non-CA” record from VE7NTT. W4CAT broke his own TN record, but W8MJ was just shy of breaking his own MI record set last year. Once again, all California Counties were on the air in force, thanks in large part to the mobile operations by K6AQL (N9HZQ and K0DI) who covered 25 counties; from Alameda to Yuba. They were joined by W5WMU/6 (six counties) and W6ZQ (two counties). County Expeditions are Field Day style operations from rare counties, or at least a nice location that’s off the beaten path. Twenty-one different County Expeditions were active in 18 counties. These operations ranged from simple to complex M/M. Doing an expedition can be a lot of fun. The SO competition was fierce, as W6PH in Inyo county again beat out AD6E, this time in Yolo county, for the top spot. 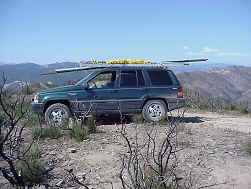 N6DE put on the best M/S expedition along with K6ENT out in Mariposa county. They edged out N6A in Alpine by the narrowest of margins. W6ML did the best M/M expedition, from Mono county. They were staffed by W6KC, W6SW, W6JTB, N6PY, and KX6H. A major part of the fun is to work all 58 multipliers. With all this activity, no less than 28 stations outside CA managed a complete CA sweep. This compares to only 18 last year. This year saw the very first sweep from Europe as HA1AG managed to achieve this amazing feat. The very first sweep was made by VY1JA when he worked K6JKC in Lassen at 01:21Z. That’s 9 hours and 21 minutes into the contest. Congratulations to Jay! In California, 39 stations found all 50 US states plus the eight Canadian call districts for sweeps. Compare this to 48 last year! This is the only state QSO party where the number of multipliers is the same for both in-state and out-of-state operators. The very first sweep from CA was made by W6KP at 22:27Z at 6 hours and 27 minutes when he contacted NL7KF for AK. Congratulations! 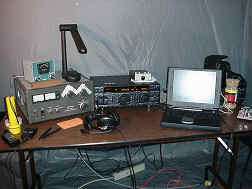 Another first for the 1999 CQP was a QRP category. After a good start last year, the number of QRP entries this year actually dropped from 25 to only 18. They are noted in the results tables with a “Q” after their scores. As with the schools, we hope the word gets out to the QRP community to get more activity in the next CQP. A total of 19 new records were set this year, with 11 CA records and 10 state records falling. New records set this year are tabulated below. If you add up the total number of QSOs in the logs that were submitted, we see there were 63,324 CW QSOs and 120,471 SSB QSOs. Of course, these are only the REPORTED contacts. There were 464 logs submitted, yet the total number of active, non-unique call signs seen in these logs totaled 5,462! Every sort of call appeared, from 2E0AOZ to ZS6WP. This is after the list was trimmed to eliminate common “busted” calls. Obviously CQP is a lot bigger than the relatively small number of submitted logs would make you think. There were 4,947 such calls seen last year. Log checking was tackled by AD6E, W6OAT, NF6S, K6EP, N6DE, and K6III. Log checking rules were established by the team as follows: Any simple copying error such as wrong NR, wrong QTH, or wrong call was penalized by reducing the score by ½ of a QSO. Double copying errors (e.g. wrong call and wrong NR) or worse were penalized by removing the QSO. The team used extensive search software to be as accurate as possible. Only QSOs that were either proven to be in error, or had a very highly probable error were reduced. No penalty was given by software alone. There was always a human judge to make the actual decision. Overall, log accuracy was very good. Claimed scores were reduced by an average of 1.9% and resulted in changing the outcome of final standing in very few cases. This is pretty close to what we saw last year. The good news is that only 11 logs had greater than 10% score reductions due to errors, while there were many “perfect” logs where no errors could be found. In summary: It was a great event!! - I had lots of fun! Wire antennas for 40 & 80 at AD6E on a remote Yolo ridge top. AD6E arrival at Yolo ridge top. Bold entries in these tables indicate logs received by AD6E. Please submit corrections to W0YK.